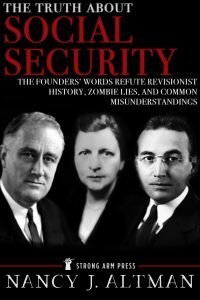 Altman is president of Social Security Works and author of the new book The Truth About Social Security: The Founders’ Words Refute Revisionist History, Zombie Lies, and Common Misunderstandings, which is being released on Aug. 14, the 83rd anniversary of the program. “More fundamentally, Roosevelt and the other founders had a bold, expansive vision of Social Security. They understood the phrase to encompass economic security that extended, in FDR’s words, ‘from the cradle to the grave.’ Indeed, in a 1938 speech, founder Molly Dewson, one of the three members of the Social Security Board (later replaced by a single Commissioner), defined Social Security to include education, a good paying job, housing, and guaranteed universal health insurance, as well as insurance against the loss of wages in the event of unemployment, old age, short- and long-term disability and death. “In that 1938 speech, Dewson explained, ‘sickness compensation against loss of earning power during temporary or permanent disability [and] adequate medical care, including whatever medicines, treatment, and hospitalization are needed may still be mostly pious hope. But it is not a vain hope; both of these measures are already on the horizon.’ She was, of course, talking about what we today call Medicare and paid medical leave.